We barely squeezed in our annual pilgrimage to the top of the Second Creek drainage and over to the 12,000 foot high point of Mary Jane Ski Area. Second Creek is popular with backcountry skiers and snowshoers, with great accessibility from a wide spot on I40 just below Berthoud Pass. Marla, Kim, Marc, his daughter Hannah, and I hiked up past the site of a new backcountry cabin, then straight up the bowl to the top with 180 degree views of the Indian Peaks and Vasquez Peaks. Byers Peak caught the first sun to break through cloud cover and the air quickly warmed to temps more like May than the end of winter. We made a slight detour and hopscotched from one snow island to the next to avoid treading on fragile tundra, not normally a concern in March. Panoramic Lift, at just over 12,000 feet, is an amusing lunch spot, with skiers off-loading and pointing at us, a few asking where we hiked from. We soaked in the sun while dining on lukewarm burritos, fruit, nuts, and brownies that emerged from our packs and compared notes about the stunning lack of snow and the few skiers on a spring break Sunday. Kim, who grew up in nearby Granby, and Marc, who has a condo in Fraser, have never seen such a light snowpack in March. It’s officially 65% of average statewide and above average temps are predicted for the next week. If we don’t get a big dump soon, it’s going to be a parched summer across the West. A summit view from James Peak, aka "The James" on the last day of winter, 2011. Water supplies for Front range residents lie frozen on the peaks until spring thaw unleashes a steady stream of the most precious resource in the West. A year ago, on our third attempt of the season, we summitted James Peak just before sunset. 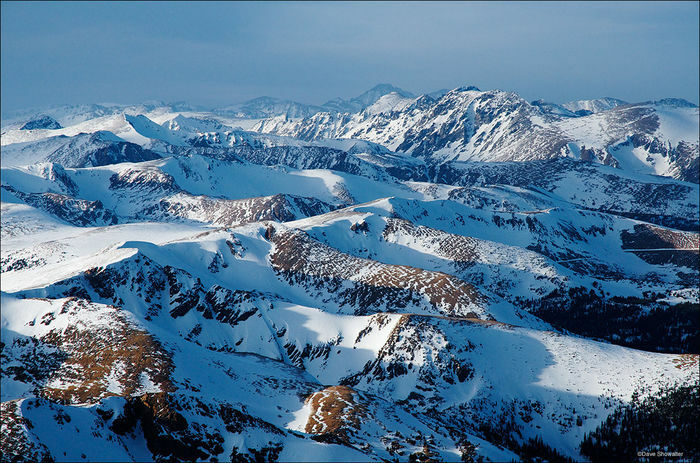 The photograph above shows the remarkable snowpack in the winter of 2010/2011 – water supplies for a thirsty Front Range. Spring was cold and wet too; so there were no out of control wildfires, no water rationing, or talk of conserving water. Go ahead, drench your Kentucky bluegrass! Let your kids wash your car in the street for two hours! The problem is, we rarely talk of conserving water until it’s too late… and it’s already too late in 2012. The mountains in the top image drain into the Fraser River, which gets sucked almost dry by a pipeline to Denver. Our small group understands that fishing and recreation will be severely curtailed in the Fraser Valley this summer; and the cumulative impacts to the ecosystem are incalculable. It doesn’t have to be that way. Rather than live by a Western boom or bust water cycle, we need a culture of water conservation where every resident is a stakeholder. Rather than build more pipelines, let’s tear out more bluegrass and educate Westerners about our most precious and fragile resource. Posted in Colorado Mountains on March 26, 2012 March 26, 2012 by Dave Showalter. Great and thoughtful stuff, as always Dave! I agree, “… tear out more bluegarss.” And, we can shorten our shower time and frequency. And, drive less. And. …..
Denver Water (which the metro area cities follow) has a great conservation page on their site and is doing many things well, but… their customer base is largely disconnected from the source and fragile nature of the water supply. I’d like to think that most people knbow that our water comes from the mountain snowpack, that our consumption directly impacts vulnerable alpine ecosystems, communities, and recreation; but that would be giving way too much credit. I bet more than half would say it comes from the tap.